If canonization defines that someone is in heaven, then there is no problem with infallibility. But Aquinas says canonization cannot be infallible if it is taken to mean that someone is a model of heroic virtue, because, he says, the Church cannot know the particulars of someone's soul. 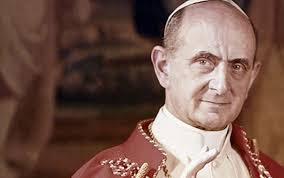 As to Paul VI: if Francis isn't pope, then his canonization of Paul VI isn't a canonization. Francis may not be pope, according to some. But I am quite happy to think that Pope Paul and Escriva "de Balaguer" and Oscar Romero made it to heaven. So did my grandma, most likely. ^Lol...what are you even talking aout? "[John Paul II] has been canonized nonetheless, and I accepted it and moved on. That's what I am doing with Paul VI...I am shrugging and moving on. That's how I handled the canonization of John Paul II, and I have to say, it was not damaging to my faith at all. Ultimately, I am just a lay person and the Church's solemn judgments have more authority to me than my own subjective opinions about a person." Where was I bitter about JPII's canonization? How can you deduce that I "hate" the Supreme Pontiff based on any of these comments? I don't even know what you mean by "ultra Traditionalist." I attend the NO and go to the TLM only about once a month. What makes you think I have hatred for John Paul II or any pope? I have a picture of Pope Francis in my house, as I did of Benedict before him. I certainly don't hate the pope. No idea regarding all VI but JPII is recorded in the Maria Movement of Priests as being Her Pope. It's recorded so in the book of messages. Hi buddy. I dont think I agree with your assessment of the canonizations of the conciliar and post conciliar popes. I dont have to be a political tactician to recognize that these canonizations are primarily serving to canonize the second Vatican council. We should hang out soon and chat about it, and more interestingly, other things lol. Let's just all agree not to call these guys "saint" or put it front of their names when typing about them. It doesn't necessarily deny any authority in canonization, and it's just a small step in not promoting their cult (or lack thereof with some of these guys). Personally, I cannot call Paul VI or JPII "Saint" as it is indeed damaging to my faith. Their status is heaven is nothing to contest - as even the most intentionally vile people can make it heaven through a conversion (deathbed or otherwise). Calling JPII a "saint" when he helped people break the first commandment and as a result helped those people worship demons is extremely offensive. If I call these people "saints" I feel like I am betraying the Catholic faith and offending God - whether that is correct or not, I simply cannot call them saints. I cannot call people who did harm to the Catholic faith, without repentance or correction, a "saint." But again, they can be "saints" in heaven, and that is not my issue. The process of canonization has become a joke and a political tool in some cases - as noted the real issue is imitation, heroic virtue, a safe model of Catholicity. "Personally, I cannot. My faith. If I call these people. I feel like I am. I simply cannot. I cannot." Your name should be Alex Short, for the shallowness of your thought. Allow me also to say, that canonisations have always been a question of money, politics and influence. Perhaps the next step is not to call them Popes because they disagree with you. Why do you say people are in lala land if they think pope Francis is an antipope? There have been them before and there will be again so why not. And the pictures of Benedict in white keep coming. Still having a hard time finding a black cassok in Rome? I don't claim to know but it is mentally more easy for me to come to the antipope conclusion then accept all this crap that has happened under Francis. Also I love the comment that calls this an untra traditionalist blog. Cleary they have not spent much time on catholic blogs. "Alex Short" lol did it take you a whole 4 seconds to think of that? Perhaps calling people names is the theme of the those who support the canonization of these men? I already gave you one example for your thoughts: The 1986 Assisi meeting. Yet, you offer no rebuttal as to why JPII who accommodates pagans in breaking the first commandment on consecrated Church ground, a public act against the faith with no public correction, should be called a "saint." Now, instead of throwing around lame name calling, why not engage in the substance of the matter, son? your name should be Palex Short, called after a humourless mind. To answer, you are commenting on an article linking to an essay dealing with these very questions. And you have chosen to ignore both of those, which is the third and final reason I see no point in engaging you. "To answer, you are commenting on an article linking to an essay dealing with these very questions. And you have chosen to ignore both of those, which is the third and final reason I see no point in engaging you." What do you mean, infallibility? All the articles are talking about infallibility with canonizations. I am *not* talking about infallibility. I really don't think you can process what I am trying to get at. I will dumb it down for you: Do not call these men "saints" as that will spread their cult and directly or indirectly bolster the destruction they have caused in the minds of the faithful. Read carefully and slowly, it's very simple. Nothing about denying infallibility here. You throw childish insults around and you can't even understand something a 6th grader can comprehend. Bizarre - or maybe very appropriate. Alex is not speaking to the question of infallibility. He is saying, "Okay, for the sake of argument lets say the canonizations are infallible. Even so, let's refrain from going out of our way to promote the cultus of Paul VI or JPII because they are such mixed bags and the promotion of their cultus could be confusing." Let us not go out of our way but care about important things, not because of any of us matter, but because important things matter. Some 19th century Popes, part of a 19th century plot, don't matter. Today I couldn't recall what all of the joyful mysteries are. For shame! Just stumbled over De Matteis sad article regarding this at Rorate Caeli. It was hard to see. And then I remembered a sermon by father Wolfe of the FSSP. In it, he angrily proclaims something along the lines of: "If we doubt that someone like the Pope who is mentioned in tens of thousands of masses and rosaries every day, can be saved, then boy are we all in trouble." I find that comforting to remember.